The super topping tail often precedes a correction or crash in a stock. If you learn this pattern, you might be able to avoid nasty drops. This pattern is very similar to the topping tail pattern. The difference is that the super topping tail has a longer tail at the top. It is the opposite of a super bottoming tail that hints of a bullish reversal in stock prices. Both are Japanese Candlestick patterns. Although they only consist of one candle bar, where it happens can have a profound impact on stock prices. The image above shows what a super topping tail looks like. It consists of one Japanese Candlestick bar with a small body and a long tail at the top. The appearance of the super topping tail can be very bearish due to what has happened in the smaller time frames. Imagine that one bar represents one trading day. When you zoom into the intraday charts, the stock ran up for the day, topped out and then proceeded to correct and close very far away from the top of the day. This tells us that the stock does not have the strength to keep its gains. The bulls tried to move up but the bears are so powerful that they prevented the bulls from keeping their territory. The super topping tail can come with a body or not. If it has a body, it will be a small body at the bottom. When there is no body, it means that the stock opened and closed at the same price. This is the right candle pattern you can see in the image above. Below are some examples of the super topping tail in action. KMI had a nice gap up in mid July 2017. The stock had a nice run up throughout the day only to meet its 200 MA which acted as a resistance. The 200 day moving average on a daily chart can be very powerful. If a stock rises from below to touch the 200 MA, they can often find resistance at the 200 MA. This is what happened to KMI. 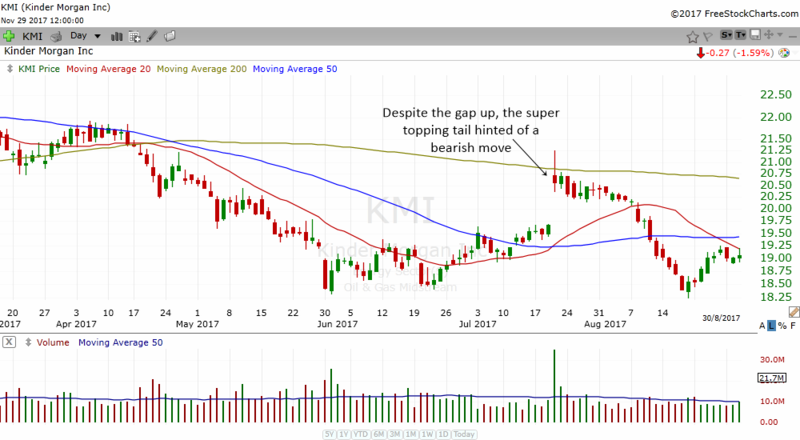 When KMI touched its 200 MA, it could not hold on to its gains and closed near the lows of the day to form a super topping tail pattern. When you combine the super topping tail pattern with the 200 MA resistance, it gave a clear warning to traders that KMI might have a correction soon. Notice how KMI started to drift lower after the appearance of the super topping tail. That is the power of this bearish reversal pattern. If you see the super topping tail appear in your stock, it is wise not to ignore it. Investigate it and see if it will make the stock go lower. NOV had a super topping tail in late July 2017. You should imagine what happened to the stock that day. The stock actually rose quite a lot. If it closed near its high, it would have formed a large bullish bar that engulf many previous candle bars. Instead, it was unable to hold on to its intraday gains and it formed a super topping tail. Notice how NOV corrected after the appearance of the super topping tail. Those who were observant could have avoided the time consuming correction in this stock. STAY provided a very interesting case study of how prices can be quite volatile. Prior to the appearance of the super topping tail, the stock had a very large bullish bar. It gap down lower but immediately erased all losses. The bullishness spilled over to the next day. The stock actually tried to go above the previous high. However, it could not hold on to its gains and closed lower to form a super topping tail. STAY proceeded to have a correction after the appearance of the super topping tail. Not all super topping tails or topping tails for that matter will result in a correction or crash in the stock. 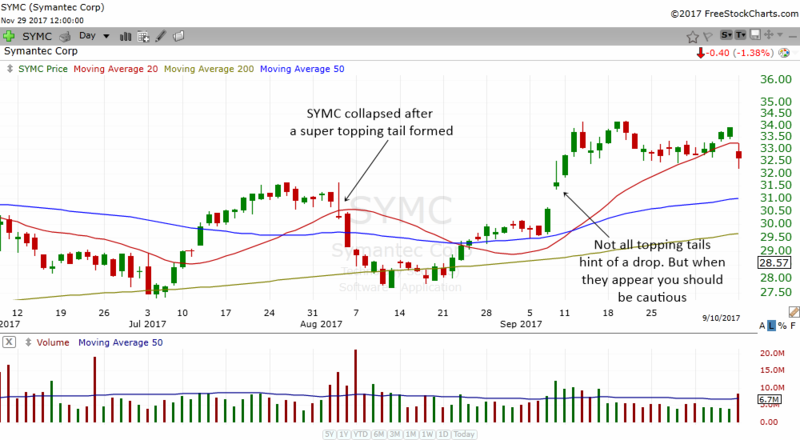 In early August 2017, SYMC formed a super topping tail which resulted in a correction in the stock price. However, the topping tail formed in early September 2017 did not result in a correction. 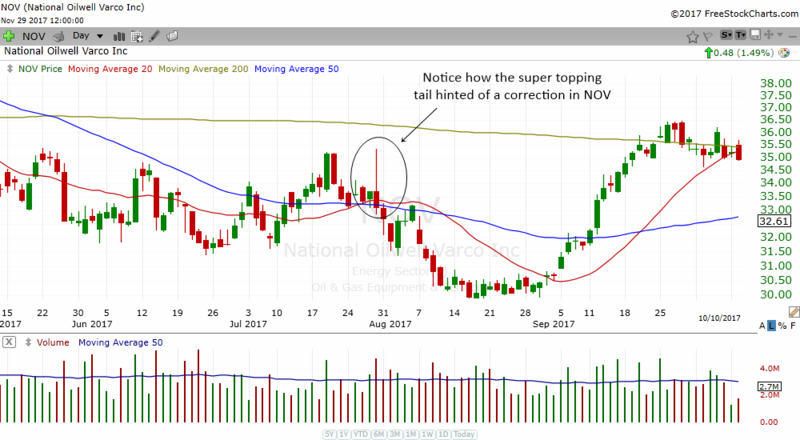 You can often filter out a good super bottoming tail by monitoring it and see whether the next day's candle will break below the lows of the super topping tail. In the first topping tail in early August, the stock went below the lows of the tail the next day. In September, the stock just continued to move higher. While not all tails will result in a correction, the trader or investor should be cautious if it appears in their stock. Learn to monitor the price action carefully if your stock forms a super topping tail or any topping tail. 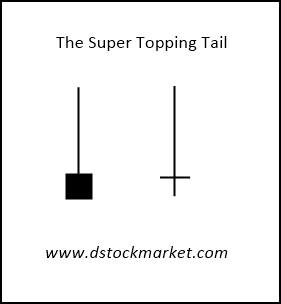 Some traders might also utilize the super topping tail as a trading strategy. 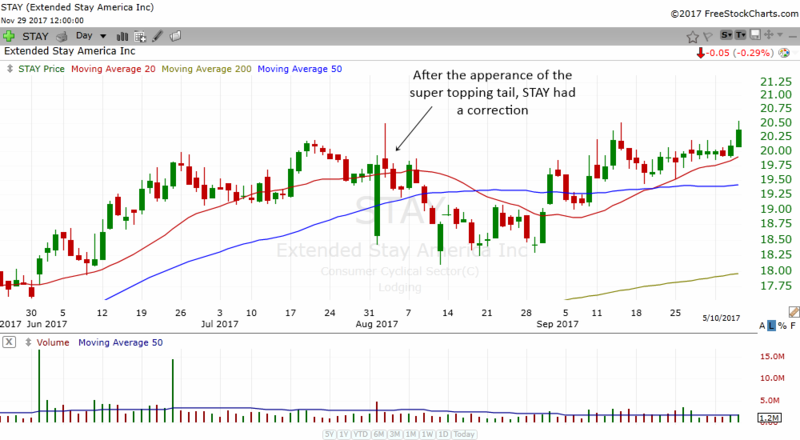 You can short a stock that forms a super topping tail for a swing trade.